Until the age of five, Loung Ung lived in Phnom Penh, one of seven children of a high-ranking government official. She was a precocious child who loved the open city markets, fried crickets, chicken fights and being cheeky to her parents. When Pol Pot's Khmer Rouge army stormed into Phnom Penh in April 1975, Loung's family fled their home and were eventually forced to disperse to survive. Loung was trained as a child soldier while her brothers and sisters were sent to labour camps. The surviving siblings were only finally reunited after the Vietnamese penetrated Cambodia and started to destroy the Khmer Rouge. Bolstered by the bravery of one brother, the vision of the others and the gentle kindness of her sister, Loung forged on to create for herself a courageous new life. 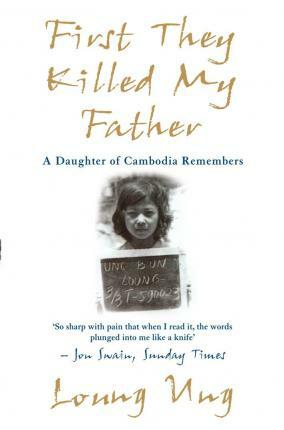 First They Killed My Father is an unforgettable book told through the voice of the young and fearless Loung. It is a shocking and tragic tale of a girl who was determined to survive despite the odds. "So sharp with pain that when I read it, the words plunged into me like a knife"
Loung Ung's debut memoir, First They Killed My Father, was an international bestseller. It is now being made into a film which will be co-written and directed by Angelina Jolie Pitt. Loung Ung is also the author of After They Killed Our Father: A refugee from the killing fields reunites with the sister she left behind. As an author, lecturer, and activist, she has dedicated twenty years to promoting equality, human rights, and justice in her native land and worldwide. She has lectured widely to schools, universities and corporations on Cambodia, child soldiers, women and war, and landmines. She currently lives in the US.